Holiday bookings for summer 2019 are 12% ahead of this time last year, according to ABTA, which described the market as ‚very vibrant’. Speaking at the launch of ABTA’s annual Travel Trends report, chief executive Mark Tanzer said consumer confidence had not been dented by Brexit ‚at the moment’. However, he said consumers were booking earlier and they’re looking for value for money. They’re likely to become even more cost-conscious if the pound continues to be volatile, he added. For this reason, ABTA named affordable Bulgaria and Poland as two of its 12 destinations to watch in 2019. It also predicted that 2019 would be the year that responsible tourism goes mainstream, having already seen a 6% increase in people who claim to consider the environment when choosing their holiday. Costa Rica, said ABTA, is ‚very difficult to beat’ for those looking for a sustainable holiday. Denver in Colorado, US, was another destination ABTA predicted would be hot in 2019, as it has, it said, ‚some of the best national parks in the country’, while Durban in South Africa, Jordan and western Australia were also tipped to be hot following the launch of new direct flights from the UK. Not surprisingly, it tipped Tokyo to do well next year as Japan’s capital will host both the rugby World Cup and ABTA’s Travel Convention. Galicia in Spain, which was described as ‚like Scotland but with a better climate’, Madeira, Thessaloniki in Greece and Uzbekistan, which featured recently in actress Joanna Lumley’s TV series on the Silk Road, completed ABTA’s top 12 destinations to watch next year. ABTA said its list was compiled after speaking to members, talking to tourist boards and visiting this year’s World Travel Market. In positive news for travel agents, ABTA said one of the key trends it had spotted this year was a ‚resurgence of the trusted travel expert’. With so many destinations and so much information available online, consumers were increasingly turning to agents to sift through the options and present them with a curated choice, it said. Several high street agencies, including Scotland-based Barrhead Travel, have expanded this year, and there has been a 10% rise in homeworkers amongst ABTA members, it added. „Trusted travel experts are expected to have a bright future in 2019,” said head of media Emma Brennan. 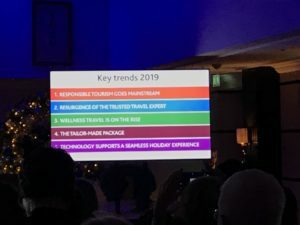 Other trends include a 20% increase in wellness holidays, a rise in tailormade travel and greater use of technology to make travel easier, such as Jet2holidays rolling out its flight check in service at a greater number of hotels. Last year saw a 5% increase in holiday sales, but the growth of the staycation slowed, said ABTA, with the number of domestic trips taken in the year to August falling from 2.1 per person to 1.8. It blamed the awful weather at the start of the year, which was followed by the ‚Beast from the East’. People also took fewer short breaks, with the number taken in the UK falling from 1.3 to 1.1 per person, while the number of foreign mini-breaks fell from 0.4 to 0.3 per person.